In the opening scene of episode 5, she strides through the department store where she has a job interview, while Rogers and Hammerstein’s “I Enjoy Being A Girl” plays in the background. I’ve always been fascinated by this song, which manages to be both an incredibly happy ode to being a woman, while also being quite sexist and old-fashioned, relying on stereotypes about what it means to be female, and extolling the joys of cat calling and finding a man. And yet, (and yet!) whenever I listen to this song I always feel a wave of pride—so many of today’s songs make being a girl seem awful, and this song just makes being a girl seem fabulous. It’s the perfect song choice to open an episode that is devoted to Midge staking it out on her own. After being turned away from an elevator operator job (“I have such a passion for it. I grew up with one in my building!”) Midge cheerfully advises a shopper on lipstick and gets complimented by the woman at the counter (“You should get my commission. Really.”) runs upstairs again to the same manager who rejected her, and asks to be a make-up girl. Her parents are both less than thrilled by the decision, but Midge is excited for the opportunity for what she views as a new adventure. You start to get the sense that Midge’s question about whether or not she was ever actually meant to be a mother makes sense: she doesn’t seem at all interested in spending time with her two little rugrats, who are constantly depicted as afterthoughts to be shuffled to grandparents and babysitters. Something else I loved about this episode was the depiction of Midge’s coworkers, a crew of genuinely sweet young women who are smart, savvy, and eager to help Midge adapt to her job, “You’re one of us!” the woman she met the previous day who told her she should apply excitedly squeals. Midge is open-hearted and affable and the ladies welcome her into their circle. 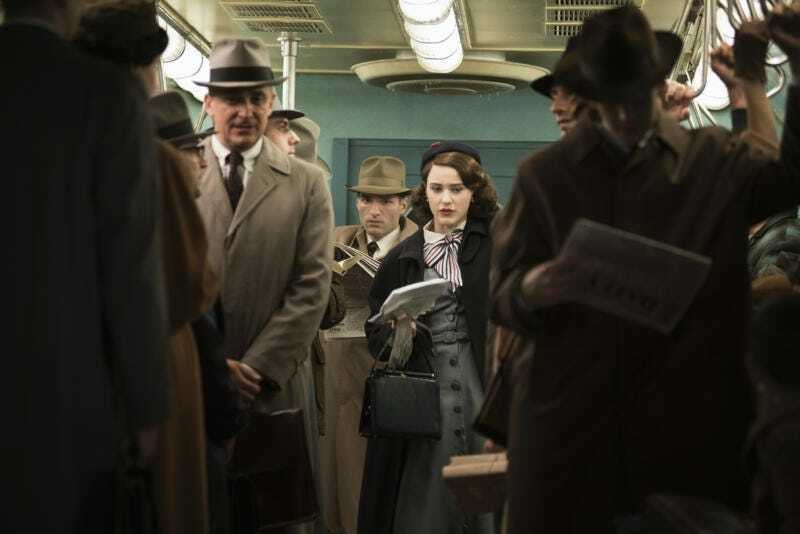 A lot of shows depict women as natural adversaries, but Mrs. Maisel insists on the possibility of female friendship and the series consistently passes the coveted Bechdel test. It may be fun to punch in, but work is...hard work. After her first day, Midge realizes the importance of a nice pair of flat shoes. Her mother continues to treat her job with cold disdain and is less than impressed by her gift of a new shade of lipstick. Midge doesn’t care that much—soon she’s off to perform comedy, where, for the first time, she completely bombs. She has some great observational humor, but fails to realize that her audience doesn’t have the context to understand many of the jokes. The more she has to contend with a silent audience and hecklers, the more anxious she gets, and she ends up leaving the set early. “Everybody bombs,” Susie comforts her roughly, but Midge doesn’t want to hear it and ends up making the unfortunate decision of hiring someone to write jokes for her. Why on earth Midge trusts Herb Smith, a man who holds his business meetings at a deli, is unclear, but Midge is desperate to be successful. Sadly, as you may have guessed, his act is generic and terrible (he does order some fantastically Jewish food though—kasha varnishkes, anyone?—and he also does include a free pickle in his notes for Midge). When Midge performs at The Gaslight, she once again bombs, this time with Herb’s cards in hand. When her heckler gets a larger round of applause then she does, Midge runs off the stage, announcing that she officially quits. This leads to a huge fight between her and Susie, who each vow to never speak again (though we have three more episodes, so I am hopeful). As per usual, Joel is being the opposite of his wife—dull and not particularly socially savvy. He takes Penny Pan to meet his parents, even though it seems as though he has only been separated from Midge for a few weeks. Both mom and dad do not give Joel their blessing, which Joel is bizarrely shocked by. Later, he is similarly confused when his friends (who are also friends with Midge) refuse to go to the theater with him and his new squeeze. I am #teammidge and could care less about Joel, but I did start to feel sorry for Penny—poor “Methodist Midge” seems so dopey and unable to see how she is being used, when Joel is so clearly grasping at straws. In the end, Midge goes to her coworker’s party, and, in perfect form, begins to naturally draw a crowd of admiring ladies who laugh at all her jokes, and it’s clear that even though Midge had a few off nights, she is a natural and it’s only a matter of time before she is back on the stage performing. Meanwhile, poor, schmucky Joel who thought leaving Midge would make him happy, is seen looking despondent next to Penny and two empty seats that should be filled with friends, as “Trouble in River City” from The Music Man plays in the background. The final image is a shot of Susie, who is despondently waiting by her newly purchased managerial phone. Don’t worry, Susie—I have high hopes that Midge will return for episode 6! “Always be on time. Always be polite. Always be pretty. And remember to punch in.” Words to live by (though Midge’s coworker did seem to skip over that last poster slogan. I guess “Always be courteous” seemed redundant). The most obvious aspects of Jewish culture are probably the gentile jokes and the food references, but I also love the details in Rose and Abe’s home—from the menorah in the living room, to the sight of the mezuzah at the front of the door. I think my grandparents may have had the same one! I love how frank Midge is about the fact her husband left her. This is particularly interesting when seen in contrast to how her mom has tried to hide their separation. Midge is bursting with confidence and doesn’t seem to feel the need to impress people. She also always just comes across as completely guileless, which is part of her disarming charm. The moment when she offers the drink back to the guy who was hitting on her was absolute perfection.